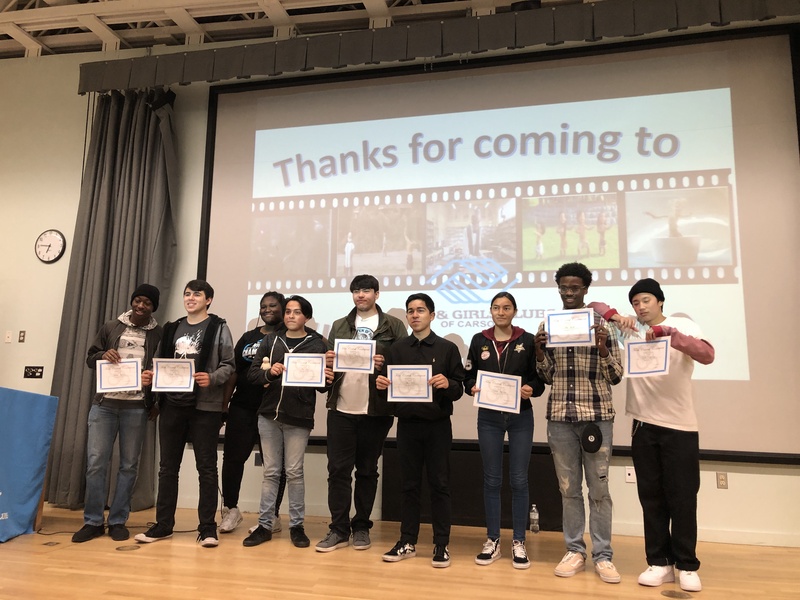 The World of Film and Production Club, a club where students learn about and practice filmmaking, held a film contest at Carson High School on March 1 to help fund their purchase of movie set and camera equipment. The CHS Boys & Girls Club helped sponsor the event. “We hosted the film contest as a way to see many different talents, which I myself was very impressed with,” junior Misha Edwards, the founder and president of WOFP said. The contest showcased six short films from 12 different creators. The projects ranged from PSAs, to comedies, to horror films. With family and friends present, the creators debuted their work to be judged by their peers, with the winner having received a $50 Visa gift card. Contestants were treated to free entry and concessions as a thanks for their submissions and hard work. Before their videos were shown, each creator, or team of creators, gave a small preview of their project and made the audience aware of what they had in the works. Part 1 of the showcase began with films from Carson High School graduates Lavar Johnson, Joseph Gamache, and Sergio Ramos, juniors Miguel Galindo, Natalia Figueroa, and Nayeli Gutierrez, junior Nate Smith, and senior Sarahmae Espinosa were presented. Following Part 1, a short intermission took place, where the audience purchased concessions and discussed the thus far presented short films. Part 2 of the showcase featured projects from seniors Jason Bauguess and Noel Diaz, and junior Gabriel Lingatong. After all the videos were presented, members of the audience submitted their ballots with the name of the creator(s) whose video they enjoyed best. In the end, Gabriel Lingatong won out, having closed out the night with his horror film receiving the most applause, and the most votes. Lingatong’s film was in the found footage format, and featured two friends, played by Lingatong and CHS senior Noah Carlos, and their cameraman as they ventured into a sewer system at night, where supernatural activity ultimately unfolded. Edwards disclosed her disappointment with the contest not having met its monetary goal, but made sure to extend her gratitude to those that attended the event. “We are very thankful for what we were able to raise,” Edwards said.